Here is another fabulous blog find. This living room belongs to blogger Lauren Liess of Pure Style Home, and was stenciled by her husband Dave using a Ralph Lauren wallpaper stencil design. 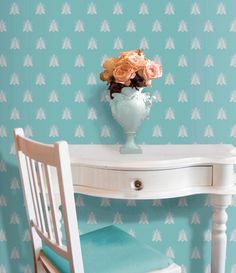 Stenciling an entire room with wallpaper stencils can be a time consuming task — Lauren writes that it took Dave 3 days to finish. If you plan to tackle this type of project yourself, you may want to invest in an additional copy of your stencil, or even a production size, if available, to shorten the process. Stenciling with a large stippler or using a roller stenciling technique can also work, depending on the effect you’re looking for. To read more about Lauren’s living room, visit her blog at Pure Style Home.